Patients at one Louisiana healthcare provider are combining two of Apple's newest technologies, HealthKit and the pulse-sensing Apple Watch, to enhance monitoring and treatment of hypertension. Ochsner Health System currently has three participants in the trial program, according to the Times-Picayune. 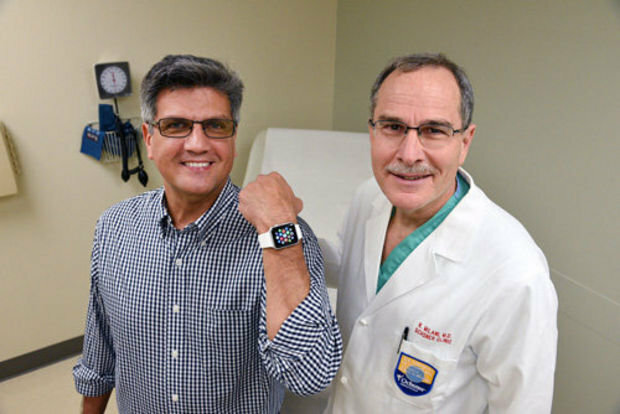 Each patient is given an Apple Watch at no cost —though they are required to purchase a wireless blood pressure cuff —along with training on the use of HealthKit and various fitness apps. Data from HealthKit can be sent directly to Ochsner's electronic medical record system. This helps with accuracy and allows physicians to diagnose potential issues sooner, notes Dr. Richard Milani. "We're only getting couple of readings a year on you," Milani told the paper. "We could probably do better if we get more information, and we can course-correct faster. People who do take their (blood pressure) readings will say 'I forgot them at home.' This keeps track of it for you." The group hopes to expand the trial to a total of 30 participants. In recent months, Apple has worked to become more deeply involved in medical research and treatment. Along with HealthKit, the company also announced ResearchKit, a framework that allows hospitals to more efficiently recruit participants for and administer clinical trials.